As a result of the growing popularity of the 'Tide pod challenge,' whereby people are posting online videos eating the brightly colored laundry packets, Procter & Gamble has been forced to launch a PSA-of-sorts with New England Patriots'player, Rob Gronkowski. Popularly known as 'Gronk,' the NFL star last starred for P&G in their 2016 Tide TV spot whereby he pretends to be a dry cleaner who rips stains out of a customer's shirt. 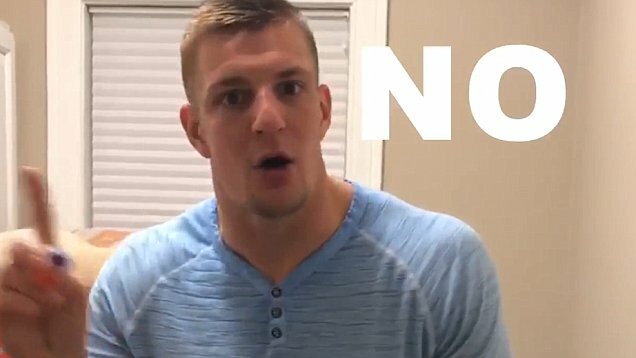 Now, Gronk is featured in a video tweet and Facebook post urging people not to eat Procter & Gamble's Tide pods. It's undoubted this latest effort by P&G is a response to the American Association of Poison Control Centers latest warning that the 'Tide pod challenge' trend has become a significant concern in 2018. The challenge first appeared in 2015 with online videos of teens eating detergent packets. "The 'laundry packet challenge' is neither funny nor without serious health implications," said Stephen Kaminski, AAPCC's chief executive and executive director, in an online statement. "The intentional misuse of these products poses a real threat to the health of individuals. We have seen a large spike in single-load laundry packet exposures among teenagers since these videos have been uploaded." A spokesperson from Procter & Gamble said it was working with social networks to remove harmful content, as well as the American Cleaning Institute to provide information to college students. "Nothing is more important to us than the safety of people who use our products. We are deeply concerned about the intentional and improper use of liquid laundry packs by young people engaging in intentional self-harm challenges," the company said in an emailed statement. Procter & Gamble has since made Tide packaging more difficult to open and has also has posted safety information on its website, including the Gronkowski advert.